Anyone who knows me, knows I love my wood stove. It keeps my house toasty warm. The floors, walls, and ceilings are all warmed so that I can walk around barefoot in my 68 degree house if I want. Just try doing that in a house heated by a furnace! So, there is no doubt that I’ll continue to enjoy the benefits that radiant heat can provide. There are down sides to everything and heating a house tends to produce really dry air. My furnace has an Aprilaire whole house humidifier attached to it. On those rare occasions that I do use the furnace, my Aprilaire adds much needed humidity to my really dry house. Of course, not everyone has such a device, so houses heated with furnaces can suffer from a lack of humidity too. Horridly dry air has a number of nasty side effects. For example, you might find that you literally can’t breath because your nose is so dry. Petting the cat becomes an experiment in shock therapy (and don’t even think about brushing the dog). You could see damage to your furniture as well. The glue joints tend to fail when the humidity is too low. So, there are both health and monetary issues to consider when it comes to winter heating. The issue that seems to elude most people though is that humid air is able to support more calories than dry air. This means that really dry air actually feels cooler than humid air heated to the same temperature. Humidity that causes you to sweat in summer keeps you warm in winter. Over the years I’ve come to believe that keeping a house as humid as possible in the winter (within reason, you really don’t want the walls dripping either) is a good idea. When my hygrometer (a humidity measuring device) reports 60 percent, I’m quite happy. Even 50 percent is worthwhile achieving. The problem is that with wood heat, you don’t have an Aprilaire to help out. Assuming that your wood stove provides a place to put one, the first course of action is to get a couple of inexpensive soup pots—big ones. Actually, you might be able to get one almost free at a thrift store or garage sale, so look around to see what you can find. Fill them with water and put them on the wood stove. The heat will evaporate the water inside and produce humidity for your home. If you want, you can add wood stove simmering spices to make you home smell nice as the water evaporates. The people living with you in your closed up house will appreciate the fragrance. My stove will accommodate two pots, so I have two really large pots going most of the time (one is removed when I want to heat water for tea, heat something up, or make soup). Sometimes using the pots just doesn’t help enough, unfortunately. It’s during those times that I leave the bathroom door open when I shower and turn off the ceiling fan. The ceiling fan normally takes the humidity outside, which is a really good thing to do in summer when you don’t want things rotting inside the house. During the winter, it seems like a better idea to allow the steam to get out into the house. Of course, you’ll need to exercise more caution to ensure everyone keeps their privacy intact. Winter is also a dandy time to make soup. It’s possible for me to make soup on my wood stove when it’s completely fired up. However, there are a lot of times where I still need to use the stove. In those cases, I keep the stove’s vent fan off so that the steam from the soup stays in the house. Not only does the house get humidified, but it also helps build a healthy appetite. I’m sure by now someone is wondering why I haven’t mentioned the obvious—a humidifier. Yes, a humidifier will do the job and yes you could use one, but all of the other techniques I’ve mentioned are free. A humidifier will cost money to purchase, maintain, and operate. In the long run, using every free technique at your disposal first is the best idea. Let me know your ideas on humidifying a home at John@JohnMuellerBooks.com. There is nothing quite so pretty as the sun glinting on new fallen snow. The landscape is whitewashed. The brown and dying leaves are covered over and hidden from view. There is even a crisp clean scent in the air that is impossible to reproduce at any other time of the year. A good shovel is a good investment. Take the time to handle any shovel that you are going to purchase before you spend money on it. Test it out in the store to make sure that you are comfortable with how it feels and moves in your hands. Slide it along the floor. Lift your coat with it (to mimic the lifting of snow). Try before you buy. There are some great ergonomic shovels out there, but there are also some gimmicky tools as well. Spray the edge of the shovel with a product like Pam cooking spray or dry silicone spray to make the snow slide off easier. Wet silicon lubricants, such as WD40, don’t work for this purpose because they have alcohol or other solvents in them that can actually melt snow, making it stick to the shovel. New fallen snow is easier to shovel. Getting out into the snow before it gets too deep will give you a better result when clearing driveways or sidewalks. Yes, you may have to shovel a couple of times, but for good traction it is best to clear down to the surface. If the snow is removed before the first person steps on it, it clears much better. Be ergonomic when shoveling. Start slowly. Use several different styles for moving the snow, rather that repetitive motions over the whole job. This will exercise different muscle groups. If the snow is wet and heavy, lift smaller loads with each shovelful. If you aren’t able to get clear ground underfoot, install handholds. Adding handrails down the stairs and along the sidewalk can save you from a dangerous fall. Ski poles can be stored by the door and used to help you walk over icy and snowy ground. If you are doing lots of outside chores, there are several styles of boot cleats that grip the icy ground very securely. They can be found in most sporting goods stores, usually in the ice fishing section. Lastly, there are several different types of snow melting products to help with traction on your walks and driveways. Read the instructions carefully and follow instructions. Stay current with local ordinances for their usage in your location. If the snow is light enough, you can use a leaf blower to remove it from the walks quite quickly and with little strain. Walking upright will also reduce the risk of falls. Always be sure to wear hearing protection when you use a leaf blower. Even if the sound is less noticeable on a snowy day, you can still damage your hearing. Waking in the morning to a bright shiny day is one of the benefits of living in the snowy north. Staying safe while walking and shoveling will give you the chance to “slide” when you have your sled or toboggan in hand. If you have any tips or stories about making it through the winter, I would love to hear about them. Please leave a comment here, or email John at John@JohnMuellerBooks.com. As I was growing up, I helped in the kitchen quite a bit, especially during canning season. 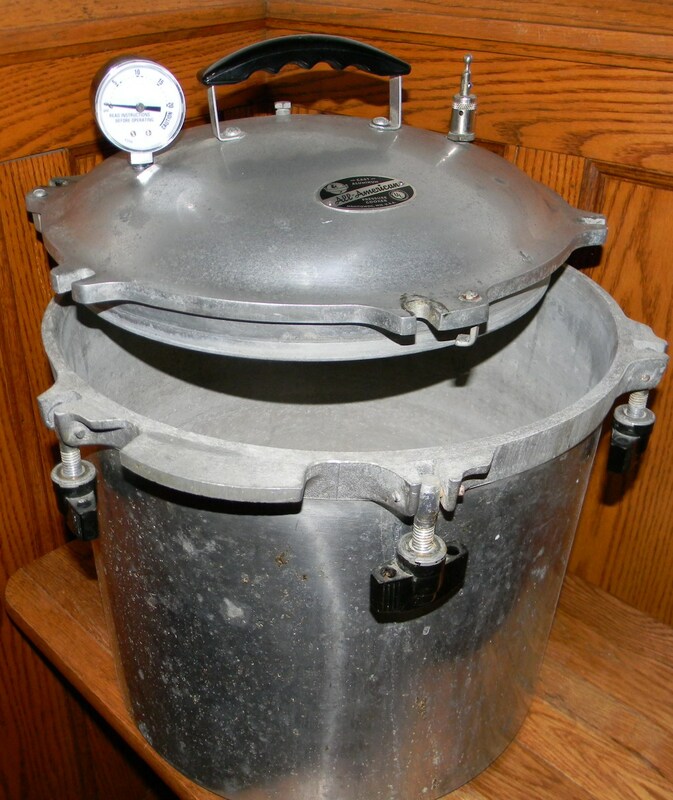 We had several big blue (water bath) canners that were used for pints and quarts of all kinds of tomato products as well as jams and jellies. I never saw my mom use a pressure canner. One day I asked her—why? It turned out that before I was born, she and her mother were working with a pressure canner. They went into the other room for something and forgot to check on it until they heard the pressure value and gasket blow off. A jar had broken inside and the vegetables had clogged the pressure valve. The content of canner spewed into the air, all over the kitchen! Seeing this chaos—and cleaning up the mess afterward—convinced my mom never to can anything under pressure while there were kids around, just in case. So it wasn’t until I was a young wife that I convinced my Aunt Betty to teach me about pressure canning. After doing some research, we went together and bought a pretty expensive “All-American” brand canner. With a new pressure gauge and careful storing, this 30+ canner is still going strong. It has a metal to metal construction with 6 turn-screws to hold the lid in place. It is extremely safe. For the amount of food that I process, it was a wonderful investment. I think of my Aunt Betty every time I use it. Here are some safety tips to use if you decide to dive into the world of pressure canning. Familiarize yourself with the equipment to make sure that you know exactly how it works before using it to process food. Be sure you know how much water is needed (a metal yardstick works well to measure the depth of the water) and how many jars should go in a batch. Follow the recipe exactly, at least the first time you are making something new. The herbs and spices used during the canning process develop as the product cools and is stored. After opening it, you can decide whether you want to change the recipe for next year’s harvest. Invest in good equipment and treat it with respect. You don’t necessarily need new equipment. Garage sales and thrift stores often have sturdy equipment for sale. Watch for breaks, holes, scorch marks or cracks in the metal. These are sure signs that the canner has been used for something other than its original purpose. Replace the rubber seals regularly, if your canner uses them. Replace the pressure valve if it is showing any sign of wear. It is important that this part of the canner be accurate. Stay in the kitchen while the pot is cooking. In this case, a watched pot is a good thing. The canner will build up to pressure. The stove must be adjusted to keep it at the right pressure throughout the whole canning time. If the pressure is under the required amount—the food won’t cook correctly. If the pressure goes over—there is risk of breaking jars and messes in the kitchen. FOLLOW THE INSTRUCTIONS for cooling down the canner. Remember there are glass jars inside and they are very fragile in this state. Do NOT open the canner until the pressure has naturally gone down to zero, according to the pressure gauge. This part of the process cannot be hurried. Remove the jars carefully and finish them according to the recipe. Putting a towel on your table or counter will keep the area drier and reduce the risk of the jars bumping together. After the jars are cool, inspect them to make sure they have sealed properly. If any fail to do so, put it in your refrigerator to use right away. 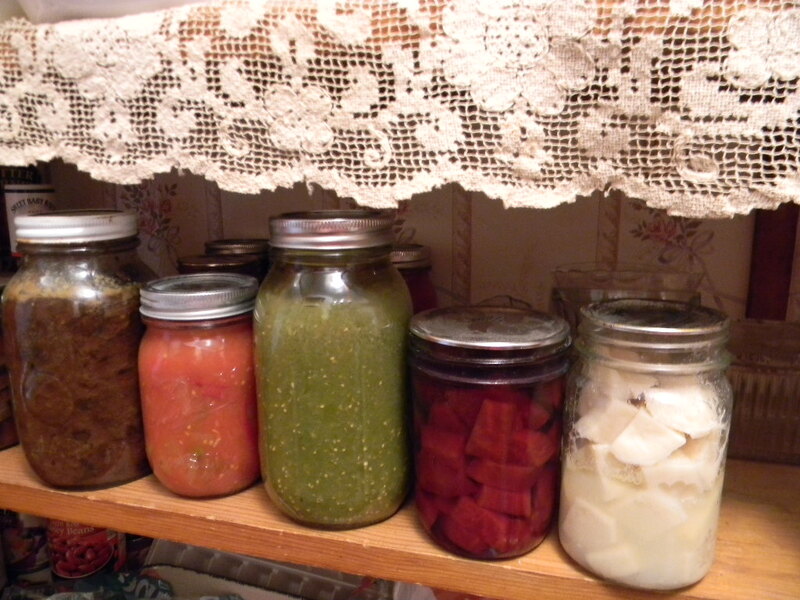 All in all, pressure canning is a great way to store your harvest, You have control of exactly what is in your food. Many recipes can be adapted for special diets. And, the jars look so pretty in your pantry! If you have stories about your pressure canning experiences or any questions, please share them by adding your comment to this post or contacting John at John@JohnMuellerBooks.com. It may not seem like a particularly important topic at first, but if you plan to sell some of your eggs, you must prepare them for sale properly. Otherwise, you’ll quickly lose your customer base. No one will say anything to you about the reasons for not buying your eggs—they simply won’t buy them. After a while, you’ll be left with a lot of eggs on your hands and no buyers. When you get the eggs from the coop, make sure you wash them. This might seem like an obvious thing to do, but some people have actually tried to sell unwashed eggs, which is hazardous to a customer’s health, as well as unappealing. I normally use Dawn Antibacterial soap to wash the eggs and then rinse them thoroughly. The soap ensures that the outside of the egg is free of pathogens. Of course, you need to perform this process carefully or else you’ll end up with a lot of unsellable eggs. After you allow the eggs to air dry (or dry them carefully with a towel), you need to inspect them carefully. Any flawed eggs go into my personal pack. Eggs with cracks are cooked thoroughly and fed either to the dogs or cats. There isn’t a good reason to waste good protein, but if the egg has any cracks at all, you can’t vouch for the integrity of the content. A mix of egg, rice, and leftover meat makes for a dandy addition to your pet’s daily food. Sometimes I throw in a few leftover vegetables as well. We don’t have any roosters. If we did, we’d also need to candle the eggs to ensure there were no embryos inside. Because we buy our chicks from other places, we won’t ever have roosters for our laying hens. You need to decide on whether to keep roosters based on your particular egg laying needs. However, it’s still possible that our eggs could have a blood spot in them. We simply offer our customers a replacement egg should this happen. So far, it never has, but it could happen given that our chickens are free range. Theoretically, you can candle the eggs to find this sort of problem, but it’s still possible to miss it, so having a replacement policy is the best way to go. At this point, you have a number of washed eggs that lack flaws. It’s time to weigh them using an egg scale. I generally keep small eggs for my personal use. Medium-sized eggs are sold at a discount, traded for something I need, or given to friends and neighbors. The large and jumbo eggs are placed into cartons and sold at full price. Create an attractive display for your eggs. For example, I’ve set up kid friendly egg cartons. The cartons will contain an attractive mix of blue, green, brown, tan, and speckled eggs (the range of colors the hens lay). Placing the eggs in some sort of pattern also helps. Even though the inside of the egg is the same in all cases, the eye catching patterns really help to sell your eggs to the public. Of course, adults may prefer a less colorful display, which means grading the eggs by color and placing like colors in a carton. The point is to make your eggs look especially nice. Preparing your eggs properly will help keep you in sales. In fact, a combination of high quality and classy presentation will usually net you more customers than you can accommodate as long as your prices are also in line with what the market will allow. Let me know your thoughts on egg preparation at John@JohnMuellerBooks.com. For many people, fall is a time when they cut the grass the last time, take their car to the mechanic for winterization, check for air leaks in the windows, and ensure the furnace will run. These common chores affect anyone involved in self-sufficiency as well. For example, you still need to get your car ready—assuming you have one. However, fall cleanup requires a lot more from anyone engaged in self-sufficiency because there are more facets to their environment. For example, fall is the time when you need to ensure your animal cages are completely cleaned. (Yes, you also clean them at other times, but fall is when you take everything apart and really clean it up.) If some of your animals are outdoors, you need to ensure they’ll have sufficient cover for the winter months. For us, that means scrubbing down every one of the rabbit hutches and letting them dry before we put a rabbit back inside. In addition, we add any manure under the cages to the compost heap. The chicken coop needs to be cleaned completely, the old hay replaced, and the windows closed. I also make sure I wash the window so the chickens can see out. It turns out that chickens like a nice view too. Of course, you take the garden down after picking any remaining goodies and plant your winter rye to prevent erosion. The fall is a good time to look for potential soil issues and possibly get a soil test so that you know how to deal with problems the following spring. Likewise, your herb and flower gardens require attention so that any perennial plants will make it through the winter. However, don’t put mulch on immediately. Wait until the garden is frozen and then put the mulch on. Doing so will ensure that the plants are properly prepared for the winter. You may not have thought of it, but all of your equipment has taken a beating during the summer months, including all of the equipment used for canning. This is a good time to scrub your pots and pans up and ensure they’re in good shape before you put them up. Make sure your pressure canner receives particular attention. Check to see if the gasket is in good shape, along with the rubber plug used for emergency pressure relief. Your stove will need a thorough cleaning and may require maintenance as well. Make sure everything is put away correctly so that you don’t have to waste a lot of time trying to find it in the late spring when you begin using it again. Don’t think you’re finished yet. Now is the time to start walking the grounds looking for problems in your orchard. For example, it’s relatively easy to find pests that hide on trees during this time of the year. Make sure you check trees for problems associated with stress. For example, pear trees are prone to crack at the joints. You might need to mark some areas for special pruning in the spring. If a problem seems especially serious, you may want to address it now, rather than later. Being self-sufficient means ending as well as you began. During the spring there is an excitement that builds that makes it easy to prepare for the new gardening season, but by the end of the season, all you really want to do is flop down in front of the wood stove. The time you take to prepare now will pay significant dividends in the spring. Let me know about your fall preparations at John@JohnMuellerBooks.com. It’s important to chicken and rabbit health to move tractors and cages regularly. We don’t keep our chickens and rabbits in a barn because allowing them access to sunshine and fresh air is far healthier. However, it’s harder to keep the tractors and cages clean outside. The manure builds up and ammonia emissions can begin affecting animal health. So, the solution is to move the animal to a new location so it has a clean place to live. You can then allow the manure to compost in place or shovel it up for centralized decomposition. However, moving cages can be hard on the back and you need multiple people to perform the task in many cases. The solution to this problem is to build a dolly specifically designed for the purpose of moving cages. Cost: Good cage wheels cost quite a bit and duplicating them over twenty or so cages gets pricey. Maintainability: Anything left outside for an extended period tends to get dirty and to corrode. Keeping permanently mounted wheels functional is difficult. Practicality: Chicken tractors must sit completely on the ground because the open bottomed cages provide protection by keeping predators out. 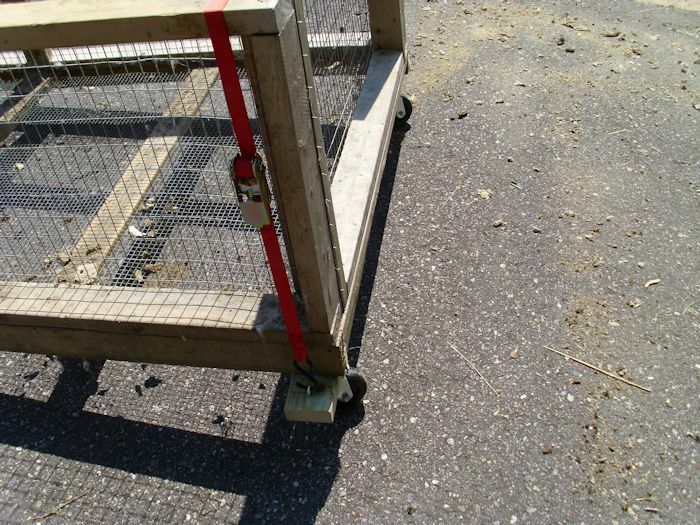 Control: Although rabbit cages are normally raised above ground level, having them on wheels is impractical when your property lacks level land (as our does). The tractor or cage could literally run away with the animals in them if the wheels are permanently mounted. A problem with most dollies is that they have four wheels. The idea is to keep whatever you’re moving level. 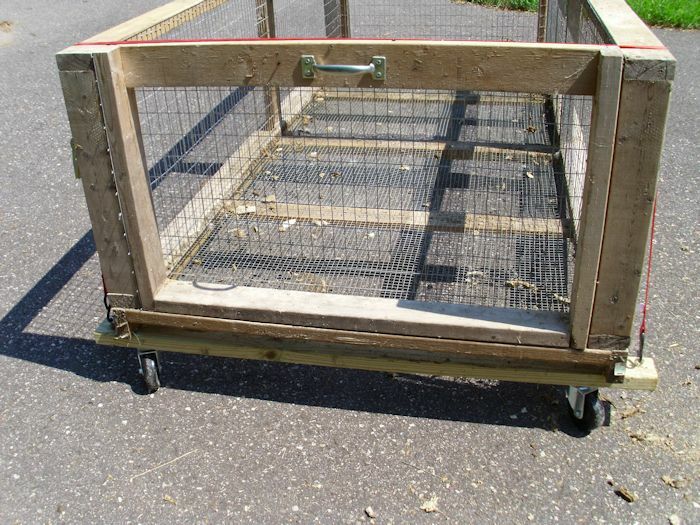 However, this approach doesn’t work well with tractors, where you want to raise the cage only enough to move the chickens or cages where you want to transition the rabbits to a moveable state a little at a time. Using a four wheel dolly also places stress on the tractor or cage and can cause the wheels to dig into the soil. The dolly I created for moving the tractors and cages has only two wheels. The setup automatically adjusts for the current level of the tractor or cage and the wheels don’t dig in as a result. You raise the end of the cage up, slip the dolly underneath, tighten a strap to keep it in place, and you’re ready to go. Here’s how the dolly looks when attached. As shown in the picture, the dolly is made up of a 2 × 4 that is a little longer than the end of the tractor or cage. There is an eye bolt at each end of the dolly for attaching the strap. The strap is the ratcheting type that has a hook on each end to make for easy attachment. The wheels are 4″ in diameter and swivel in every direction. Here is a better look at the method used to strap the cage down. Strapping the cage in place is essential and a bungee cord won’t do the trick. The cage will slip off the dolly and you’ll lose control. Make sure you get a good nylon strap with an attached ratcheting device. Otherwise, you risk losing the cage and possibly hurting the animals that you’re trying to move. Make sure you purchase high quality wheels for your dolly. 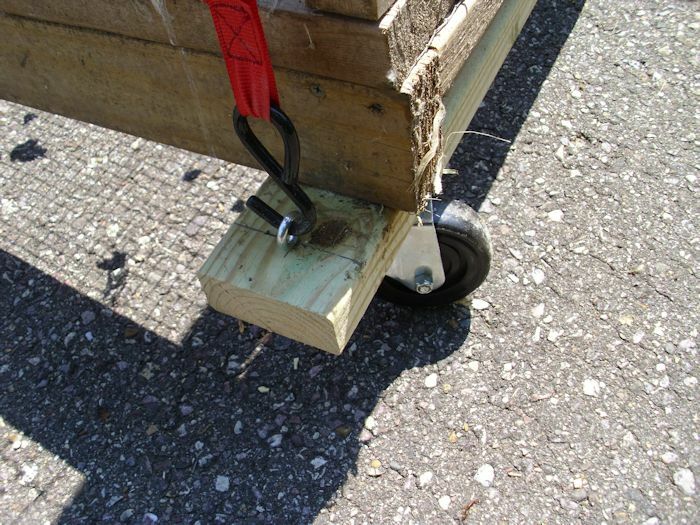 The wheels should offer four sturdy bolt positions for attaching the wheel to the dolly. In addition, the wheels should come apart for cleaning as shown in this picture. Notice that the pin holding the wheel bolts in place. Removing the bolt makes it possible to take the wheel completely apart for cleaning so that you can continue to obtain good service from the dolly. Building two dollies will make it easier for anyone to move a relatively large tractor or cage with ease without doing much lifting at all (except to attach the dolly initially). Let me know your thoughts about tractor and cage movement devices at John@JohnMuellerBooks.com. Ready Storage: Used to hold food short term. It includes the refrigerator, kitchen cabinets, and under worktable storage (five gallon buckets). Deep Freeze: Used for moderate term food storage. Some foods don’t can well or they taste better when you freeze them. We have two freezers (one small and one large) for freezing fruit, vegetables, and meat items. Because we vacuum pack our foods, we store some items up to two years. The freezers are kept at 0 or less to ensure the food is thoroughly frozen. Each summer, before we begin storing the harvest, we take everything out of the freezers and use everything that has gotten old in some way (we sometimes put old food in the compost where it turns into dirt that will be used for new food). Larder: Used for long term canned storage of food. 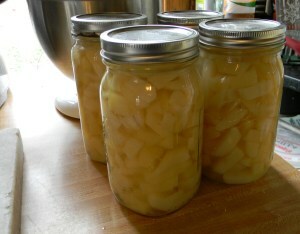 Many items will last up to five years in the larder because of the canning techniques we use. Every spring every can is cleaned and inspected to ensure it remains safe. The larder is organized to present the oldest items up front so they’re used first. Root Cellar: Used for winter fresh storage. As the name implies, we use our root cellar to store roots. However, we also use this area to store apples, pears, and squash. The root cellar sees use from September to around April each year. It’s never used during the summer months, mainly because our root cellar isn’t damp or cool enough during that time and the food would spoil. It’s essential that you determine how each area will ultimately work into your food storage strategy. Determining how large to make the larder then becomes a matter of portions. If you want to be fully self-sufficient, you need to decide where the food will come from for your meals in a general sense. Let’s look at a specific example. We drink a 6 ounce glass of juice with breakfast four days a week on average. That’s a total of 6 ounces per glass * 2 people * 4 days a week * 52 weeks a year or 2,496 ounces per year. We follow a two year plan for juice because it’s easy to obtain from a number of sources, so that’s a total of 4,992 ounces for the two years. All of our juice is canned, so all of that juice has to be stored in the larder. Juice is canned in quart jars, so we need 156 jars (at 32 ounces per jar) to store that much juice. From last week’s post you know that each shelf segment can hold 42 quart jars, so we need 3.7 shelf segments for juice. To fill out the remainder of breakfast, we usually have a grain product of some type. In addition, some meals include breakfast meat and/or eggs. Along with juice, we also drink milk and coffee. All of these items come from ready storage, so you don’t need to consider them in creating your larder. Lunch is our main meal of the day. Normally we have meat four days a week. Most of the meat comes from the freezer. However, on busy days, we used canned meat from the larder. The canned meat is computed a bit differently. We normally can the smallest chickens and one chicken produces two quarts of canned meat. Each quart contains four pieces: half a breast, wing, leg, and thigh (see Cutting Up a Chicken for details). One quart serves as a main meal and a snack when eaten directly or as two main meals when eaten as part of a salad or casserole. Normally we process eight chickens at a time and the first two processing sessions produce the canned chicken, so there are 32 quarts of canned chicken produced each year, that require 0.8 shelf segments. We produce 1 ½ years worth of canned chicken each year for two years (and take off the third year), so the maximum shelf space used at the end of year 2 is 1.6 shelf segments. Along with our meat, we normally have two kinds of vegetables, some of which come from the larder, but can also come from ready storage, the root cellar, or the freezer. This is where you need to keep records on how you use your various food storage areas. About 70 percent of our vegetables come from the larder. We eat one quart of vegetables when there is meat included in the meal and one and a half quarts on our vegetarian days. Vegetables are generally stored in pints, but there are times when we store vegetables in quarts as well. Because vegetables tend to have longer cycles between good yields we follow a three year plan. The calculation for vegetables becomes ((1 quart a day * 4 days) + (1.5 quarts a day * 3 days)) * 52 weeks a year * 3 years * .70 percentage stored in larder or 928 quarts or 22.1 shelf segments. Our afternoon snack usually includes fruit, a grain product, and a dairy product. The fruit is the only item that comes from the larder. It can also come from ready storage, freezer, or root cellar. Our fruit portion is normally 1 pint per day when taken from the larder. Because fruit production can be incredibly unpredictable, we follow a four year plan. About 30 percent of our fruit comes from the larder. This means the calculation for fruit is 1 pint per day * 365 days a year * 4 years * .30 percentage stored in the larder or 5.2 shelf segments. The evening snack can come from a variety of sources, but we normally have something quite small. This is the time of day we’ll have ice cream, leftover canned meats, fruit, cookies, or something else small such a dried fruit/vegetable slices (see Making Dehydrated Chips for details). I normally don’t include this snack in the calculations, but your eating habits might be different and you might need to include it. The new shelving does include space for four 5 gallon buckets worth of dried fruits and vegetables that don’t appear as part of the calculations that come later in this post. We also make our own condiments, salsas, jellies, and other items that take up 3 shelf segments. Again, you need to consider your eating habits and make decisions based on those habits. Now it’s time to add everything up to see how much space is required. Our total shelf segment usage (a shelf segment consists of 42 quarts or 84 pints) is 3.7 for juice, 1.6 for meat, 22.1 for vegetables, 5.2 for fruit, and 3 for condiments or a total of 35.6 shelf segments. Our two larder shelving units currently provide 39 shelf segments (not including the 5 gallon bucket/canning equipment storage in the new shelving unit). The remaining shelf segments are used for organizational purposes and for empty jars. The calculations for determining how much shelf space you need can seem daunting, but if you address one meal at a time as I’ve done in this post, you should find it possible to do. What you need to do is focus on that meal and the portions you typically eat during that meal. Let me know if you have any additional questions on this topic at John@JohnMuellerBooks.com.